Chrysalis Inn & Spa Bellingham, Curio Collection by Hilton features a full-service spa. The hotel offers a restaurant. A bar/lounge is on site where guests can unwind with a drink. Wireless Internet access is available for a surcharge. This business-friendly hotel also offers a terrace, complimentary newspapers in the lobby, and room service (during limited hours). Onsite self parking is complimentary. 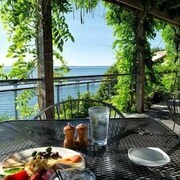 Chrysalis Inn & Spa Bellingham, Curio Collection by Hilton is a smoke-free property. 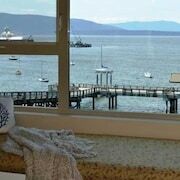 Located in Fairhaven, this spa hotel is within 1 mi (2 km) of Bellingham Cruise Terminal and Western Washington University. Fairhaven Park and Sehome Hill Arboretum are also within 3 mi (5 km). Bellingham Station is 14 minutes by foot. Along with a full-service spa, this smoke-free hotel has a restaurant and a bar/lounge. Self parking is free. Additionally, WiFi in public areas, a meeting room, and free newspapers are onsite. All 43 rooms boast fireplaces and deep soaking tubs, while conveniences include refrigerators and coffee makers. 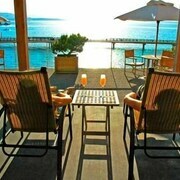 Guests will also find free WiFi, cable TV, and minibars. 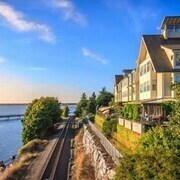 Chrysalis Inn & Spa Bellingham, Curio Collection by Hilton offers 43 air-conditioned accommodations with fireplaces and minibars. Beds feature premium bedding. Premium cable television is provided. Guests can make use of the in-room refrigerators and coffee/tea makers. Bathrooms include separate bathtubs and showers with deep soaking bathtubs and complimentary toiletries. This Bellingham hotel provides complimentary wireless Internet access. Business-friendly amenities include desks and complimentary newspapers. Housekeeping is provided daily. Keenans at the Pier - Overlooking the ocean, this restaurant specializes in local cuisine and serves breakfast, brunch, lunch, and dinner. Happy hour is offered. Open daily.